Easy, Scrumptious and Tasty White Chocolate and Pistachio Blondies – Perfect Delicious Traybake for Chocolate & Nut lovers! I have been wanting to bake another Blondie recipe since my Brownie obsession recently grew again. I love the idea of blondies as they’re not quite as chocolatey as brownies, but still damn delicious. I wasn’t really sure what flavour combination to go for, but I had oodles of Pistachios left over, so they had to be used. What else does pistachio go with? White Chocolate! 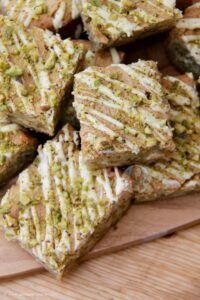 I posted my No-Bake White Chocolate Pistachio Cheesecake recipe a couple of months ago, and its always been a hit week on week. 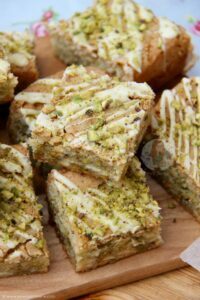 My White Chocolate & Pistachio Cake has always been popular around the holidays and such, particularly for showstoppers. 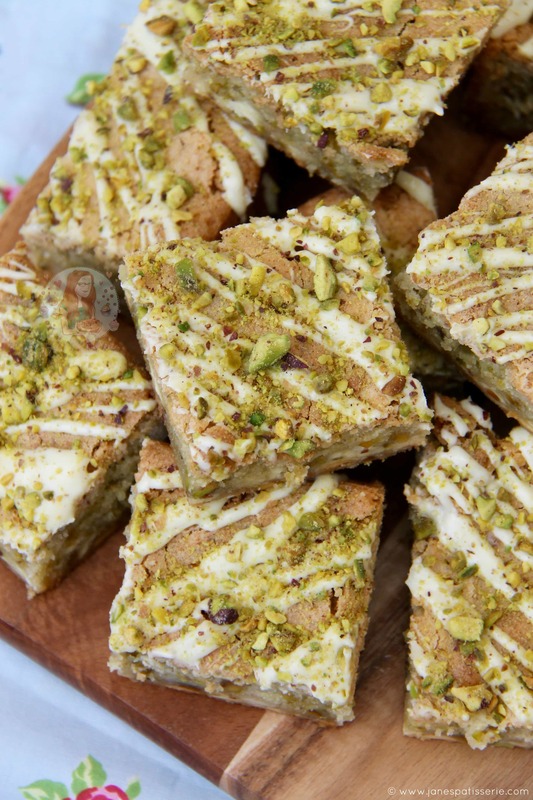 So, White Chocolate and Pistachio Blondies were born. I just can’t even cope, they’re so delicious. I wasn’t sure how to really achieve this recipe, as I wanted it to be similar to my other Brownie recipes, such as using melted chocolate in the base, but I just wasn’t a massive fan. Mixing the White Chocolate with the butter was a little odd in my opinion, and it didn’t bake so well, so I went for a more simple approach. Making it more of a cakey type base, just with less flour, made it perfect. Loads and loads of chocolate chips in there, and the pistachios, make a dreamy blondie recipe. They may not be a traditional ‘Blondie’ as it is in fact more cakey then anything, but I don’t mind that. The idea is there that they aren’t pieces of cake, and they are a traybake of sorts, so I’m calling them Blondies. I seriously like these, so I hope you do too! Enjoy! This recipe makes 16 Blondies! 1) Preheat your oven to 180C/160C Fan, and grease & line a 9x9inch Square Tin – leave to the side. 2) Melt the Butter carefully in the microwave, stir till smooth. 4) Whilst whisking, beat in the melted butter a little at a time, making sure each bit of butter is fully mixed in before adding a bit more. 5) Sift in the Plain Flour, and fold the mixture together. Add in the Chocolate Chips and Pistachios, and fold again. 6) Pour the mixture into the tin, and bake in the oven for 30-35 minutes** or till baked through. I checked mine with a skewer and it came out clean when baked! Leave the Blondies to cool in the tin completely. 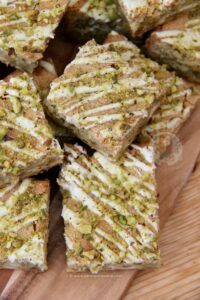 7) Drizzle over the melted chocolate, and sprinkle on the extra chopped pistachios – leave the chocolate to set and then cut into your portions. I did 4×4 to get 16 decent sized pieces! Enjoy! **Sometimes Brownies & Blondies and such can take a while to bake, for some random reason… so if at 35 minutes yours isn’t baked through fully, cover the top with foil to prevent burning and continue to bake till done! I used Callebaut Chocolate in ALL of my bakes other than when specified. I buy mine in 2.5kg bags as it makes it much easier and cheaper for me in the long run as I bake so much! You can easily use other nuts such as Macadamia, Hazelnuts, Walnut etc, but some nuts can dry things out a little more than others so be careful on adding any more than specified! Recipe inspiration from BBC Food. 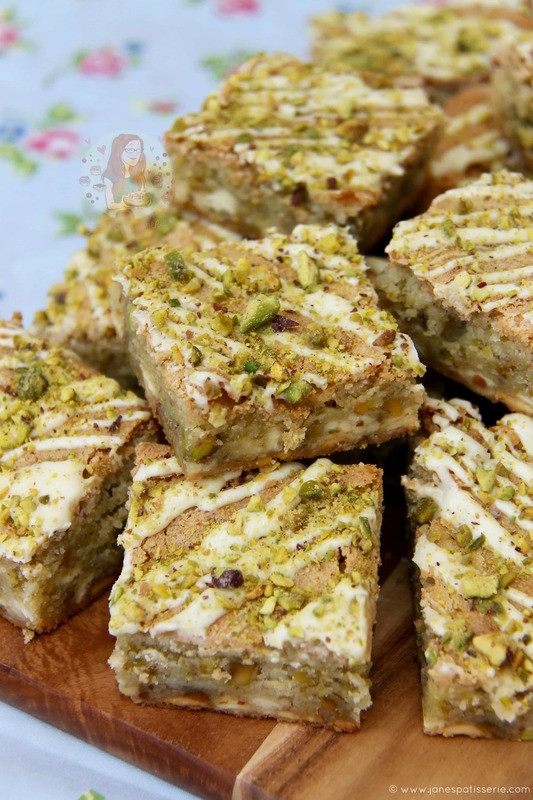 Find my other Traybake Recipes on my Recipes Page! Older Next post: Caramac Fudge! Newer Previous post: Toblerone Brownies! Hello, what size baking tray did you use please? these look delicious ! cant wait to try them ..
n im sooo glad you use grams instead of cup for measurements. it just saves time . really helpful ! Are the pistachios salted or unsalted? Can you make these without the pistachios and just white chocolate??? Oh that sounds so delicious!! I love white chocolate! Thank you! And same here! !